The feminine name Aurora is the Latin word for "dawn" so naturally Aurora was the Roman goddess of the morning. She has two siblings, a brother (Sol, the sun) and a sister (Luna, the moon). It is said that she would renew herself in the morning and fly across the sky to announce the rising of the sun. In Astronomy, the northern lights are also known as the Aurora Borealis. It is a natural light display in the sky mostly seen in high latitudes. They named this celestial phenomenon after the goddess. Beyond astronomy and mythology, though, Aurora has one of the longest Wikipedia pages that I've ever seen for a name. Aurora has so many associations across a variety of subjects like colleges, all sorts of entertainment from films to novels to song titles, fictional characters like the Disney princess from Sleeping Beauty, geographical locations all around the world, sports and forms of transportation. If you're considering this name for a daughter, I would recommend browsing through this list of namesakes. 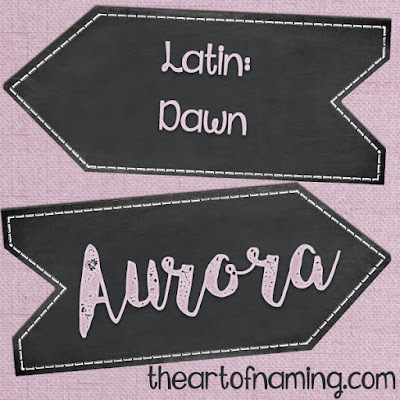 As a baby name, Aurora is definitely gaining popularity. Parents find the appeal of a goddess and a princess to be the most attractive and of course the beautiful northern lights come into play as well. This name has an elegance about it unlike any other name. Radiance and sunlight and morning dew come to mind which can all feel romantic, mystical and poetic. However, if your little princess turns out to be more of a tom-boy, the spunky nickname Rory definitely has that covered which makes this name feel rather versatile for modern parents. Aurora has been in use since the Renaissance. It has been around within the US since records began in 1880. It received a brief popularity bump from about 1920 to the mid-1930s which resulted in a high-rank of #349 in 1929. Since then, the name remained in the lower half of the Top 1000. 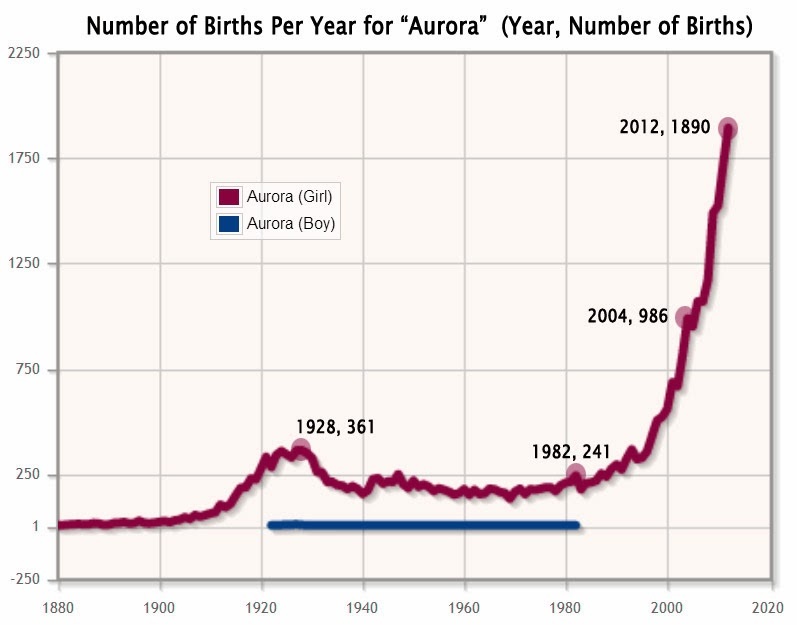 By the year 2000, Aurora climbed past the #500s for the first time in 50 years! In 2006, the number of births per year hit the 1,000 mark for the first time. And 2012 saw 1,890 births for a record-high ranking of #166. I predict this name to continue climbing and eventually be a staple of the Top 100. Revision: My prediction was accurate. Aurora continued to climb and, as of 2016, ranks at #66! That is 3,963 births for the year. I think she still has a bit more room to grow, too! What do you think? There's also the French version Aurore but it is nearly nonexistent in the US with less than 20 births since the 1940s. It did have a bit of usage from 1884-1938 though. I think this would be adorable as a middle name to a long, elegant first name. Throw some more ideas at me! Pretty name, but I find it very difficult to say fluently!